We are launching the Many Gifts - Growing Spirit 2017 campaign with a goal of raising $750,000. The funds will be invested in the areas of missions, parking and transportation, renovations and technology. Click here to read Frequently Asked Questions. Where we've been: While Covenant Partners regularly travel to Jamaica, Guatemala and the Dominican Republic, missions abound at home in Clemmons, North Carolina. 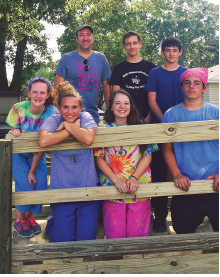 We have capitalized on local opportunities through the Clemmons Food Pantry, Boy Scouts, Music and Worship Arts, Carolina Cross Connection, Covenant Groups and shared ministries through the Bethel-Clemmons Mission Co-Op. Develop a Master Plan that outlines how the framework of our Church will continue supporting missions locally and globally. Create a reserve fund to prevent financial barriers from hindering our ability to respond to the call for ministry. Where we've been: A full parking lot is a sign that increasing numbers are regularly attending our services. Church vehicles pushed to their limits show that we have logged many miles on the road to ministry. Expand the parking lots resurfaced in 2013 to ensure our church remains inviting and accessible. Invest in an additional bus that transports Covenant Partners to outreach and fellowship activities. Invest in a trailer for disaster relief efforts, such as the annual rebuilding of eastern North Carolina homes damaged by hurricanes. Where we've been: In addition to completing the $420,000 sanctuary renovation, the 2013 Many Gifts - Growing Spirit campaign enabled us to overhaul the HVAC systems and expand and repave the parking lot. Protect our HVAC investment by adding controls, dedicating contingency funds and insulating the attic. Enhance our preschool ministry by replacing old windows in the children’s wing. Upgrade L.E.D. lighting and revitalize our church offices by upfitting the Hunter House. Improve spaces where our church family gathers for fellowship, including the kitchen and picnic shelter. Where we've been: The worship experience at CUMC has been greatly enhanced with the recent technological advancements including compelling audio-visual in our three services, a dynamic website that allows you to watch sermons and submit prayer requests online at your convenience, and a mobile app with news, events and devotionals. Adopt audio-visual components for Sunday School classes that serve children, youth and adults. Introduce video-based parlor conference calling to continue engagement with other churches and offer pastoral care from afar. Install a new phone system that will add efficiency to the outreach of our church staff.